The Milwaukee Brewers reinstated Tyler Saladino from the 10-day disabled list and designated Eric Sogard for assignment, the team announced Thursday. 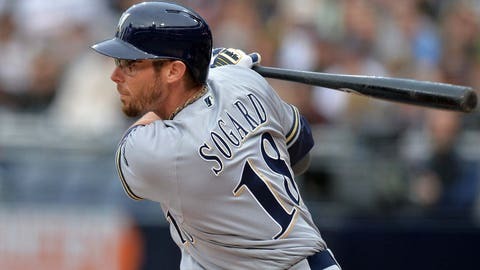 Sogard mashed a career-best .273/.393/.378 slash line with the Brewers last season but struggled to find his stroke in 2018 after signing a one-year deal worth $2.4 million in the offseason. The 32-year-old infielder tallied just 13 hits in 113 plate appearances this season, adding up to a .134/.241/.165 slash line with 23 strikeouts. Saladino was placed on the disabled list May 30 after spraining his left ankle while trying to make a play at shortstop. Acquired from the White Sox in exchange for cash April 19, Saladino was hitting .324/.359/.622 in 16 games with Milwaukee before the injury. Saladino will get the start at shortstop Thursday night when the Brewers begin a four-game series with Atlanta.